Take the fuss out of perfectly cooked poultry. Start purchasing the tasty, versatile rotisserie chicken! Today's supermarkets are jam-packed with an array of items designed to make a cook's life in the kitchen easier. Everything from canned soup to premade salads, and even pancake batter from a spray can, are now available in the hopes of appealing to the time-crunched masses. Yes, that includes you and me! More often than not, these convenience foods are far from nutritional standouts. Many pack too many refined carbohydrates and unhealthy fats or too much sodium and sugar to be considered a nutritious solution to hurry-up meals. However, there is one ready-to-go supermarket item that can definitely help you turn out a cornucopia of fast, healthy dishes: the always reliable rotisserie chicken. At 41 grams per chopped cup, this protein-packed shining star of hurry-up foods is always presented front and center near the checkout lines, and for good reason. The only work on your end is to remove the skin and pull the juicy, seasoned meat from the bone. Rotisserie chicken can be a great time-saving hack in a variety of physique-friendly meals that you can get on the table in no time. Ready to fly the coop on microwave dinners and reap the rewards of delicious roasted chicken? Grab a rotisserie chicken to go tonight, and try these three tasty, fuss-free ways to put that big bird to good use. With a taste reminiscent of pizza, each forkful of this pasta salad will excite your taste buds and provide a bounty of nutritional goodness. Consider enjoying it after a hard workout to take advantage of the dynamic duo of protein and carbs. And since it can be served warm or chilled, it's also a good option for deskbound lunches in the days to come. Healthy bonus: Because it contains more moisture, bocconcini (what you may know as small mozzarella cheese pearls) and other types of soft cheeses tend to be less calorie-dense than hard varieties like cheddar. For a fresher approach to lunch wraps, try using collard greens instead of flour-based tortillas. They are sturdy enough to hold a pile of roasted chicken and other fillings, but come without the starchy carbs. To cut the bitter taste, smooth these wraps are smoothed over with your favorite hummus. This delightful lunch option delivers a wonderful array of appetizing, textural contrasts along with plenty of hunger-quelling dietary fiber. It can be prepared the night before if your harried mornings leave little time for meal prep. Healthy bonus: Collard greens supply a number of vital nutrients like vitamin K and beta-carotene that are lacking in most traditional tortilla wraps. 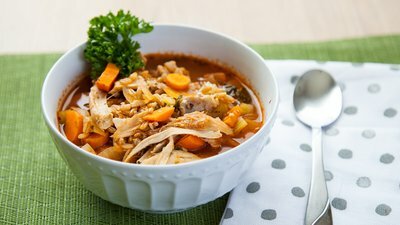 This Italian-inspired soup will bowl you over with big-time flavor and plenty of nutritional highlights, including a payload of muscle-building protein and hunger-fighting fiber. It's proof that an awesome soup need not be an all-day kitchen project. The grain of choice, farro, is an ancient Egyptian grain that eventually made its way to Italy and became a popular pasta alternative. Although farro softens when cooked, it still retains a crunch. If farro isn't available, this soup can be made with quinoa or rice. Healthy bonus: Tomato paste is an underused soup ingredient that infuses a pot with an umami flavor punch. It's also a reliable source of the healthy antioxidant lycopene.